Fabricate is the place to be in London next month, when a group of "pioneers in design and making within architecture, construction, engineering, manufacturing, materials technology and computation" all descend on the Bartlett School of Architecture for a two-day exchange of techniques and ideas. As the conference organizers explain, topics "will include: how digital fabrication technologies are enabling new creative and construction opportunities, the difficult gap that exists between digital modeling and its realization, material performance and manipulation, off-site and on-site construction, interdisciplinary education, economic and sustainable contexts." In this context, I'm reminded of the "giant 3D loom" that's been invented to "weave" parts for a "supercar." 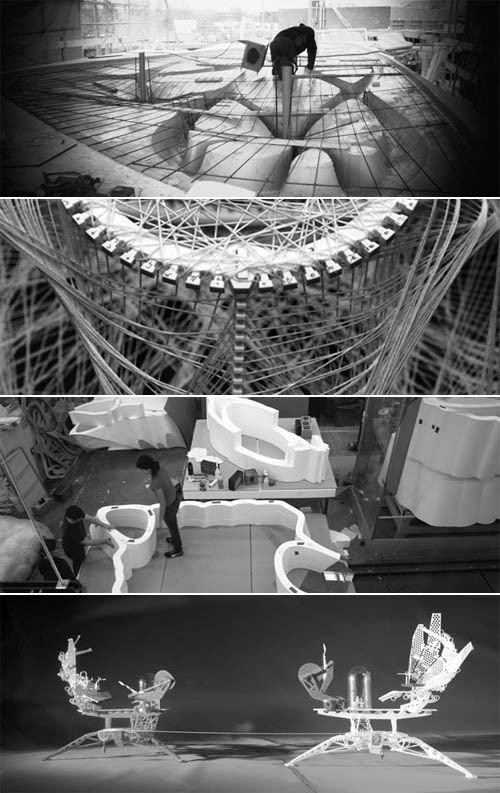 More specifically, it's "a high-tech circular loom, guided by lasers, that can weave 3D objects." The "supercar" in question, made by Lexus, "is being used as a test bed for newly-designed parts made from carbon fibre and plastic. Compared to steel or aluminium, it makes the car stronger and lighter but producing these components is much more time-consuming: only one car is currently being assembled per day." New industrial shapes emerge from a slow cyclone of threaded metal. Future silks for future objects. In any case, if you're in London on 15-16 April, be sure to check out Fabricate, and, if you see the organizers, tell them you read about it on BLDGBLOG.